In 1965, American engineer Gordon Moore was asked to make predictions about the semiconductor industry for a special issue of the journal Electronics. The future co-founder of Intel noticed that the number of transistors per silicon chip—a measure of the chip’s complexity—had doubled every year for the past 5 years. He forecasted that this accelerated rate of growth would continue for at least another decade. In reality, Moore’s Law continued for the next 50 years as personal computers and smartphones made their way to the masses. 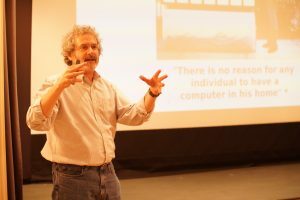 Neil Gershenfeld, Director of the Massachusetts Institute of Technology’s (MIT’s) Center for Bits and Atoms, believes that the next technology to follow Moore’s Law and become just as widespread will be digital fabrication. He foresees a world where anyone can make almost anything with the combination of design software and machines like 3D printers or laser cutters. 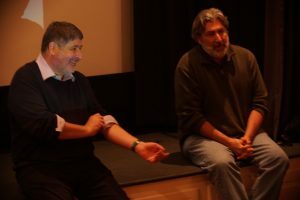 Neil and his two brothers, Joel and Alan, presented their vision of the future to a captivated audience at the latest Science & Entertainment Exchange event held in March. “Designing the Future” brought scientists and entertainment professionals together at the home of Janet and Jerry Zucker for an evening full of speculation, scrutiny, and laughter. Neil’s research lab at MIT merges the digital and physical worlds in unique ways with projects like molecular quantum computers, synthetic organisms, and the Internet of things. He describes fabrication labs, or “fab labs,” as miniature versions of his full-scale lab with a price tag of roughly $100,000. They feature computer-guided fabrication tools, such as 3D printers, laser cutters, and milling machines, and are meant to be open to the community. In the same way that computers were once a shared institutional resource and have now become personal, Neil believes fab labs are a step toward personal fabrication—not mass production, but production for a market of one person. The number of fab labs has continued to double every year for the past 10 years, akin to Moore’s Law, with the worldwide total now approaching 1,500. Will the trend continue for the next 50 years, and if so, what will it mean for the world? Joel and Alan served as the skeptical counterparts to their brother’s optimism and enthusiasm. Joel Cutcher-Gershenfeld, a professor in the Heller School for Social Policy and Management at Brandeis University, cites social factors like institutional barriers as a potential challenge to the growth of digital fabrication. It can take mere weeks to set up a fab lab and all its machinery, but sometimes years to persuade a university to open its doors to the whole community. The youngest Gershenfeld brother, Alan, brought up issues of digital literacy and access. Despite being 50 years into the first two digital revolutions, 4 billion people around the world lack Internet access, and 2 to 3 billion more have very limited Internet access. Working in a fab lab requires basic computer literacy and that factor alone would limit the number of people who could partake in personal fabrication. “In 2015, literally 50 years after Gordon Moore wrote that remarkable article, Obama made a very powerful speech about how digital access is like water and electricity. To survive and thrive in this generation, you need that,” said Alan, the president and co-founder of E-Line Media, a publisher of games that help players understand and shape the world. Despite coming from vastly different fields of expertise, the brothers all agree that the expansion of digital fabrication will continue.